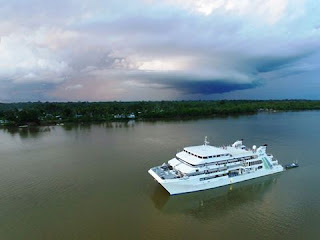 YWAM Medical Ships signed a Joint Declaration of Intent (DOI) with the Ministry of Foreign Affairs of the State of Israel on Friday last week aboard the YWAM Medical Ship, MV YWAM PNG. The DOI outlines a mutual desire to work together for the development of Papua New Guinea (PNG), including the provision of medical treatment, training opportunities for PNG’s health workforce, and capacity building projects. The Ministry of Foreign Affairs of the State of Israel will also be encouraging Israeli medical professionals to volunteer onboard YWAM’s Medical Ship, MV YWAM PNG, in rural and remote areas of PNG. The Ambassador of Israel to Australia and PNG, His Excellency Ambassador Shmuel Ben-Shmuel, said that he was pleased to sign the DOI on behalf of the Ministry of Foreign Affairs. “YWAM Medical Ships is achieving such wonderful outcomes in remote areas of Papua New Guinea. This unique partnership is the first of its kind, aiming to bring Israeli doctors, surgeons, and specialists to serve on the ship to support the delivery of expert healthcare,” said Ambassador Ben-Shmuel. YWAM Medical Ships’ Managing Director, Mr Ken Mulligan, said the signing of the DOI was a positive step toward progressing YWAM Medical Ships’ relationship with the nation of Israel. “YWAM is an international organisation that is now operating in 180 countries around the world. We believe that every nation has unique gifts and strengths that they bring. “We are looking forward to learning from one another as we continue to proceed with establishing this important partnership,” said Mr Mulligan. The signing of the DOI followed YWAM’s Breakfast by the Sea fundraising event on Thursday morning, over 700 guests gathered to show their support for YWAM’s work in Papua New Guinea. The MV YWAM PNG is due to return to Papua New Guinea in October for a 7-month deployment. Supporters of YWAM Medical Ships work in PNG include: PNG National Government, Puma Energy, Australian Aid, Henry Schein Halas, Steamships Trading Company, Network Communications, Morobe, Gulf, Western, Central, Oro and Milne Bay Provincial Governments, Lions Recycle for Sight, Port of Townsville, New Britain Palm Oil, Manolos Aviation, AkzoNobel, Gearbox Solutions, National Fisheries Authority PNG, PNG Ports Corporation, Sohe District Development Authority, Kiriwina-Goodenough District Development Authority, 1300SMILES, Honeycombes Property Development Group, Parkside Group, Haymans, Townsville City Council, Ela Motors, Ports North, Luminell, Northern Management Group, Lancini Property & Development, Mitsubishi Electric, Coutts Redington, Medical Dental Solutions, Pacific Islands International, Pro-Ma Systems, Pacific Marine Group, , Universal Cranes, Rotarians Against Malaria, Townsville Bulletin, Alcon, Mun Global, Sentry Medical, Hu-Friedy, Climatrol Air Conditioning, Alphapharm, GE Healthcare, BuzzOff, NQ Cowboys, Wilson Ryan Grose Lawyers, PwC, Trukai, and FileMaker.